1/3/10 - Happy new year! 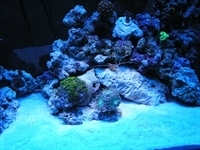 Since the last update, I've added another coral or two (see the coral section). I'm still waging war with the hair algae, but the bryopsis appears to be defeated. Cost me about 20 watermelon polyps, but I was able to salvage 10 or so. With the light running opposite cycle in the sump, the sump baffles are getting pretty colors of algae now. I've put a few snails there to try to keep in check. I think I'm going to need a few more. 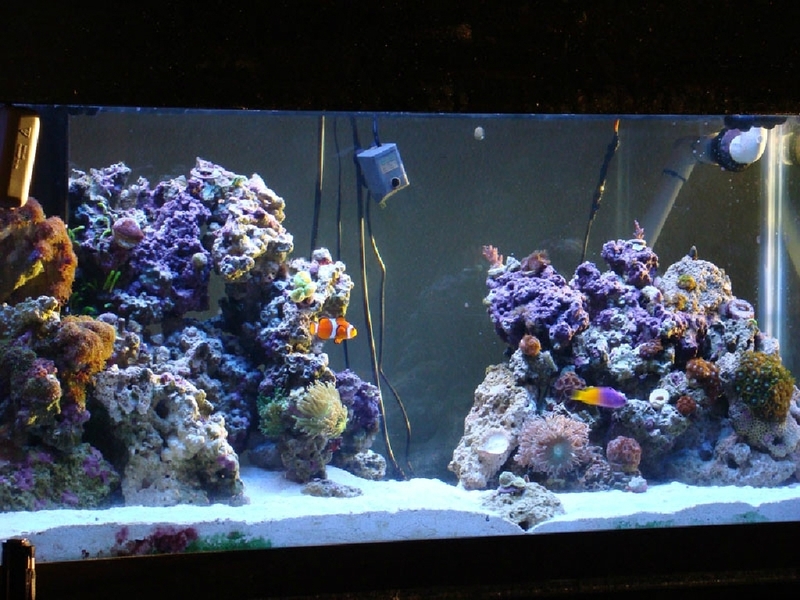 I've got to work on the plumbing a bit to re-arrange the supply lines so that I can aim the light more "downward" to keep any algae grow in one area. We also bought a RO/DI system from Bulk Reef Supply. They forgot the DI unit and the RO unit turned out to have a crack. Great service on their part. Now we have really good water to drink and no more trips to the fish store every weekend to buy water. As you can see in the pic below, I still haven't added a background. 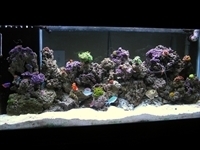 Kind of like it like this, the algae on the back glass blends with the wall color :). 2/25/10 - Been a while since I last updated, so here we go. The hair algae has gotten much worse. Went to China for 10 days, came back and I had a very hairy fish tank! 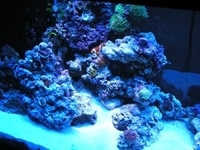 Set up a tote with 10 gallons of water to put the worst rock in and starve the algae on it of light and nutrients. I also set up another tub to take a brush to ALL the rock so that the spores won't re-enter the system (hopefully). Changed the rowaphos (GFO) and starting doing a little vodka for extra measure. I think the rowphos may be making a difference. We'll see. Picked up some more hermits and snails today as well. sooner or later they're gonna eat it. I figured 10 days with only 3 light feedings would of made a difference. Guess not. Also picked up a new coral today - I believe it's a Pavona. Was only $10 and looked really cool. 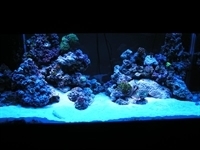 Find the pic on the corals page. Here's a shot of the tank after removing the worst algae "infected" rocks to the tote. 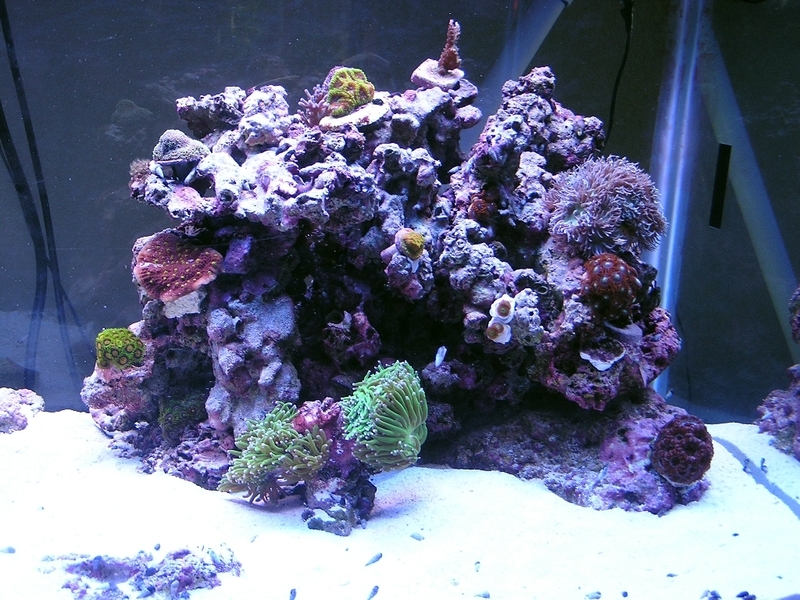 As you can see, I've moved a lot of the corals to a piece of egg crate so that the crabs and snails don't tip them. 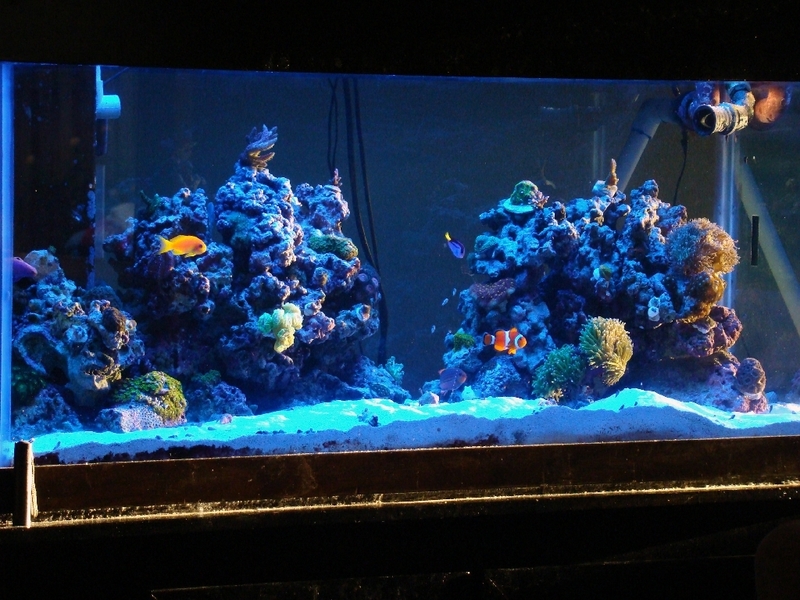 3/6/10 - The GHA battle continues...Most of the rock has been through the dark tote treatment. I've been scrubbing, changing water, scrubbing some more and I think I'm making some headway. 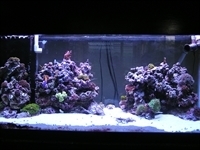 I've added 2 new Mexican turbos, and more astrea snails as well. Been pulling hair by hand out of what's in the tank too. No one seems to want to eat this crap. Looks like a thorough tote treatment should take 3 or 4 weeks. 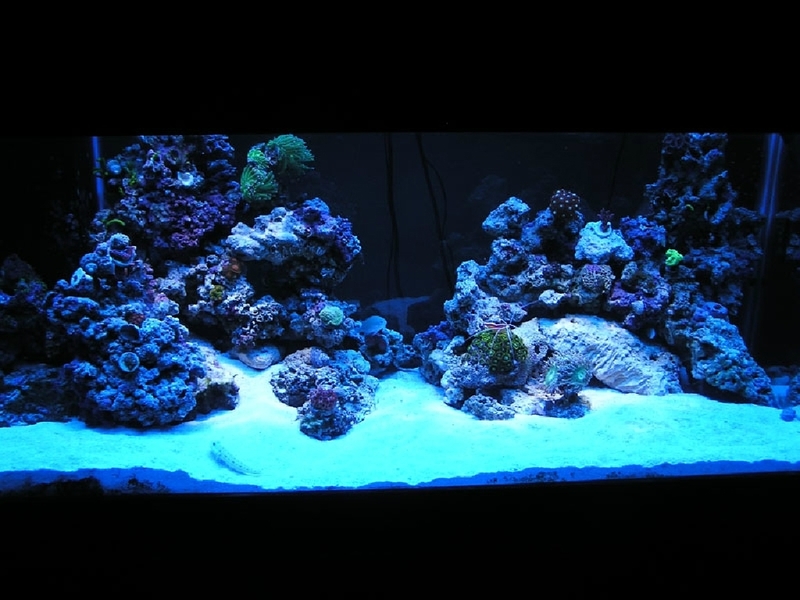 Before I did a 50% water change, I checked NO3 and PO4. They came in @ just under 10 and about .03. 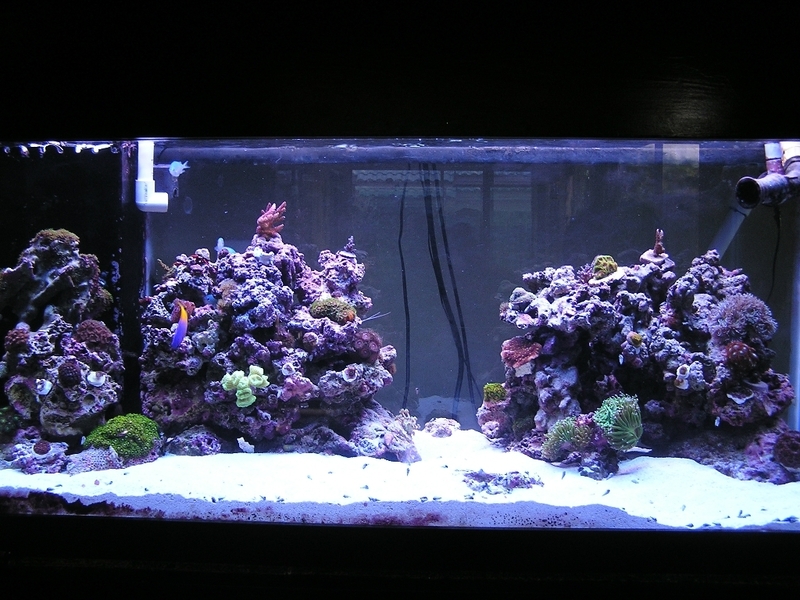 Some of the algae is dying. Re-plumbed the pumps this week too. Had to move them over to try to get them out from under the sump lamp. Looks to have worked as planned - almost. Still have to place the lamp a little better so the sump stops growing hair. 3/11/10 - The hair algae war continues...I'm moved a few rocks back to the DT and some back to the tote. I seem to making serious progress now. I've been skimming wet and dosing vodka now going on 3 weeks. I tested for PO4 last night and it showed nothing. I think I'll take a sample to FAOIS Saturday and have them use their meter to make sure. As soon as I see an increase, I'll change the GFO. If you look close enough in these pictures, you can see the spots. 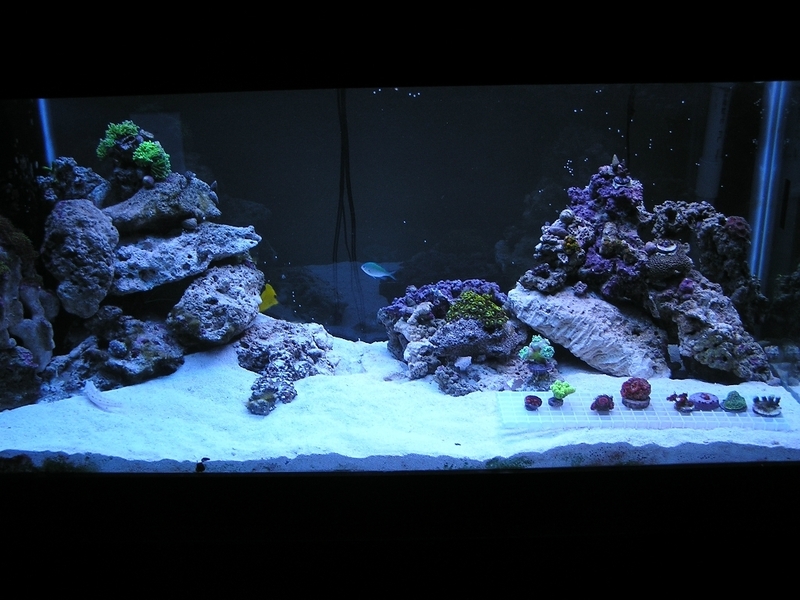 These are with 2 ATI blue pluses and the white LEDs. Notice the rocks are still kinda piled wherever right now. As long as the HA war continues, they may may need to go back into the tote. 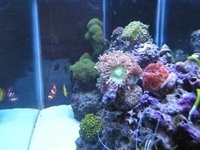 4/2/10 - I believe I have now have the upper hand on the algae war. 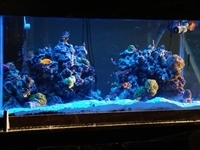 Still doing some plucking, but I haven't moved any rocks between the tote and the tank in over a week now. I can't say I have the confidence to re-arrange the rock to a "final" setting just yet though. The torch coral still appears to be troubled. I did manage to sell the LEDs - they added a great shimmer, but way too much of a spot light effect. I would need to buy several more to make it look good. 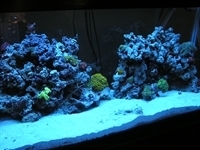 Not much else to report - other than it's that time of year when the sun hits the tank on the way down - here's couple shots. 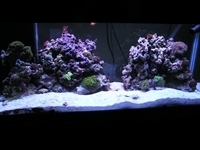 Go to the corals page though - about 8 pics there. 6/19/10 - I haven't update in a while. 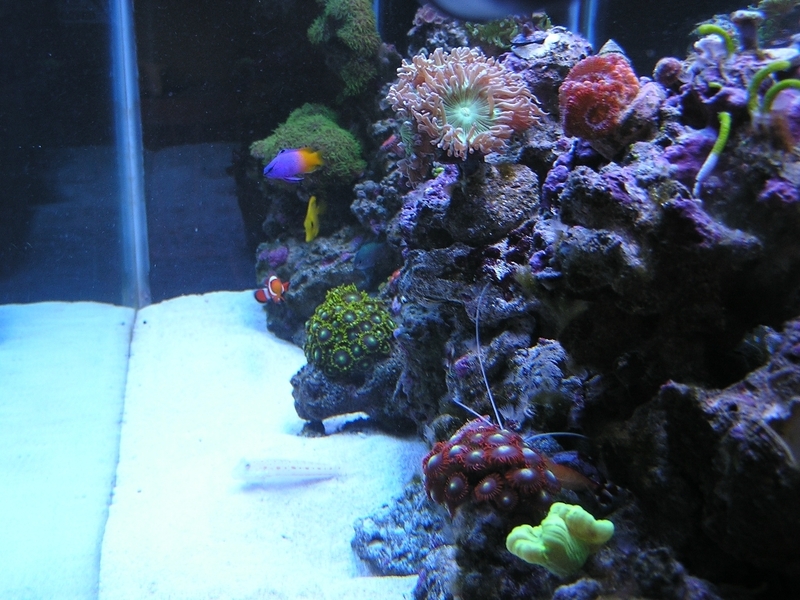 We've added a new skunk cleaner shrimp and he's actually lived more than 2 weeks. We call him "tiny" - he's only about 1" long. Does have 3" whiskers though. 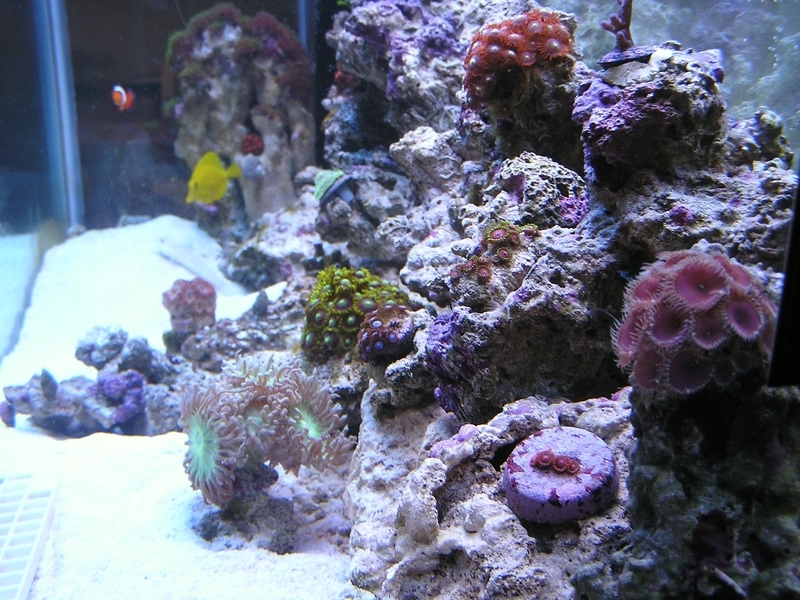 Still fighting a little algae here and there, but it's tolerable. 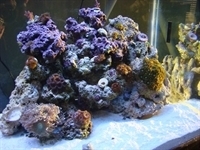 All the coral is growing good and I'm in the process of gluing down pieces to keep them from getting knocked over. 7/18/10 - Tiny is getting quite a bit bigger fast. He's very friendly, he crawls all over my hands whenever they're in the tank near him. Very cool. Algae seems to be under control, except for one rock. I swapped it out with one in the sump. We'll give it the dark treatment for a few weeks and see what happens. 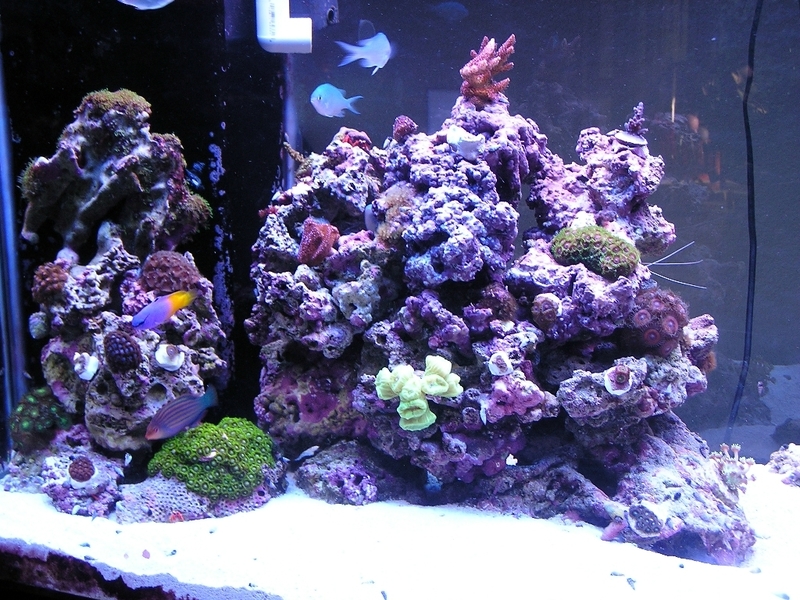 Also added two corals - a goniopora and another zoanthid. Not sure what the name of it is, but I like it and that's all that matters to me! 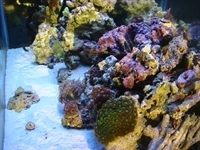 8/20/10 - In the last month, Reef Diversity had a close-out on all their corals. 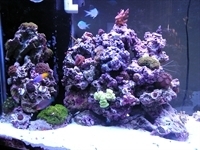 I picked up several real nice zoanthids, a "pink lemonade" sps, a green acropora sps (name unkown), a sunset monitpora, a "grape ape" favia, a yellow eyed challice (name unknown). I'm also noticing that the couple of patches of algae are starting to get a little growth to them. I think I also found a spot of bryopsis growing in what's left of the green star polyps. I've begun to dose algafix again to get on top before it gets much further along. Back in July it came time to change out the Rowaphos and I decided to try solid carbon dosing with bio pellets. Read here for detail on that. I've noticed that I don't have to clean the glass as much, but I do see more cyano bacteria. All the tests are still showing 0s, so apparently the algae is beating whatever bacteria form from the carbon to the phosphates. Or it's leaching from the rocks. It's also clear that the snails don't care for it (the algae) once it reaches a certain length. I'm changing water once a week, 5 gallons at a time. I've also started to dose a little baking soda mixture to the top off water to get the dkh back up to around 8. It's been getting close to 5. 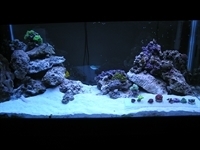 With the heavier calcium load from the additional coral, I may have to go to a 2 part dosing method at some point. We're getting close to the time of year for the sun to set on the tank too, I'll make a video for it since I haven't made a video in a while. I'm also thinking we have the rocks pretty much where I like them now. 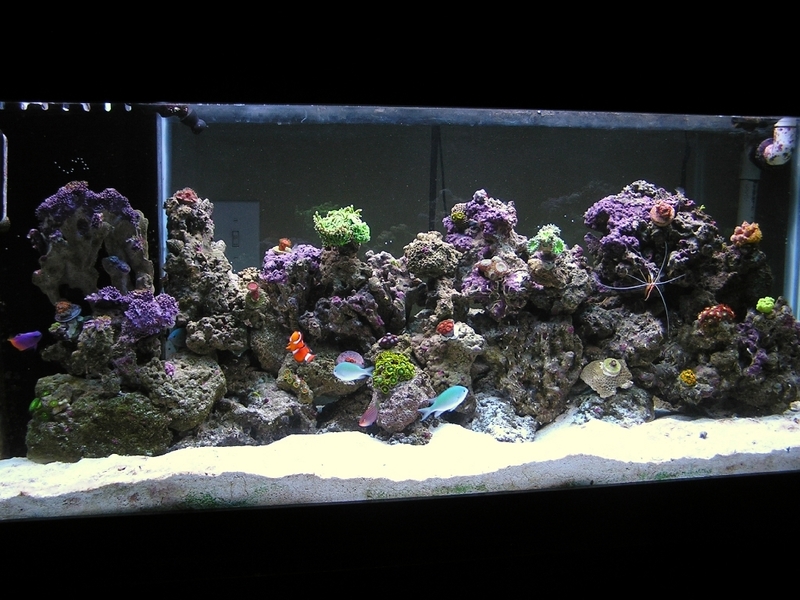 I think the next task is going to get a background back on the tank. 10/8/10 - Time for a quick update. I've been running the solid carbon (Vertex) for some time now. Still have algae hanging on. Othe than that, everything is pretty much the same. Moved one or 2 rocks, almost have the coral where I want (after 1 1/2 years). Thinking about more fish tough. 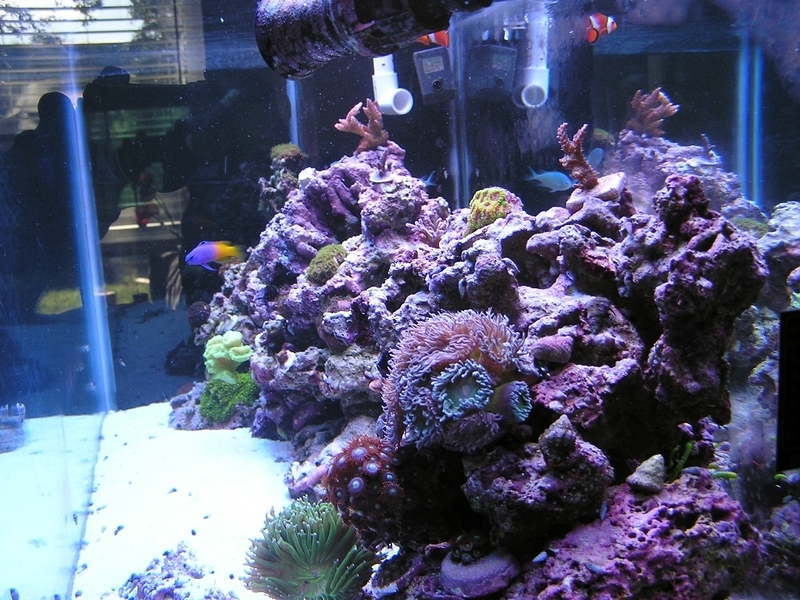 We lost one chromis - I think the clown abused it a bit much. I saw the clown grab it one day and shake it violently. I guess that chromis shouldn't of taken that pellet from in front of the clown's nose. We tried a hippo tang. He was really tiny. He had some cut on him which I didn't see for a few days after we got him. Really cut little guy. Didn't make it but a week. I saw the sixline harrassing him a few times too. Our cleaner shrimp, who was no more than one inch in June, is now full grown. Extremely friendly dude, climbs on my hand almost everytime it's near. 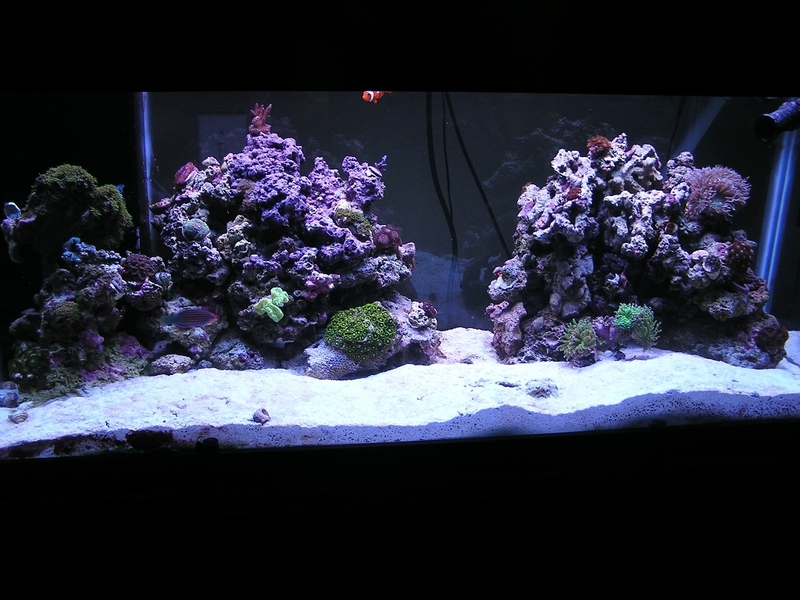 Pretty much in grow-out mode now, trying to manage the algae that's still hanging tough. I'm going to have to throw in a plug for Premium Aquatics. They called me the next morning to let me know they would be back ordered and wanted to know if it was ok. I said yes. Turns out the order got shipped the next day. My first impression was pretty good service. Once they come in and I get them installed, I'll post before and after pics.